Refrigerated cookie dough or packaged cookie dough mix plus mini peanut butter cups make preparing these cookies such a breeze. They will taste like you put a lot of effort into them. shhhh I wont tell. I usually utilize the peanut butter cookie mix and Hershey's Kisses to make peanut butter blossoms, but I get a bit bored of those. I saw these Peanut Butter Cookie Cups prepared with Reese's Miniature Peanut Butter Cups at The Pioneer Woman Cook’s. I thought this would be so much better, plus it would be double the peanut butter who doesn't like that. I love Ree's site she has the most AWESOME Recipes!!!!!!! OK Extremely AWESOME!!! !My site pales in comparison to hers. If you click on the link for The Pioneer Woman Cook's you will also see more cookie candy cup recipes. I really want to try out the brownie one's, the possibilities are endless. This really would be a prefect way to use up some of that Halloween Candy your kids still have lying around. All those mini snickers and milky way bars would be perfect to make cookie candy cups. This particular day i just made the peanut butter cups cookies so that's what the recipe ingredients are. These are the ingredients you will need. Betty Crocker Peanut Butter Cookie Mix prepared according to package directions. And Reese's Miniature Peanut Butter Cups. If using a big bag of peanut butter cups use 2 pouches of cookie mix. You can also use refrigerated peanut butter cookie dough as well then you wont have to mix anything. I used some pretty mini cupcake liners with a Fall theme, but you don't have to. If you do not use liners make sure you add the cookie dough to a greased-mini muffin tin. I have a handy helper to help me unwrap all those peanut butter cups. Hm mm I think he snuck a few as he unwrapped them. Carson said he didn't but he had chocolate on his mouth by the time he was finished. As soon as you pull the warm cookies from the oven, you’ll want to begin lightly pressing one piece of candy into each cookie. The warmer the cookies, the better. Carson helped with this part. When they’re all done, carefully remove from muffin tins with a spoon and arrange on a nice, decorative platter or cookie tray. People will be so surprised you made these with store bought cookie dough. Yummo Good!!!! Don't be afraid to mix candy and cookie dough there are so many possibilities. You can use sugar cookie dough and Rolo's or caramel kisses. Use the brownie dough and add milky ways or Rolo's or caramel kisses. Then there is the old fashioned Pb cookie dough with chocolate kisses. They have so many new Hershey kisses in different flavors you could go crazy with ideas. 1 - pouch Betty Crocker peanut butter cookie mix. Preheat oven to 350 degrees. Let your kids help and unwrap all those peanut butter cups. Using miniature muffin tins, place one mini muffin liner in each muffin cup. using a 1 inch ball of dough in each cup. Bake for about 6-8 minutes LESS than package directions instruct. Remove from oven and leave in pans. Carefully press one peanut butter cup into each cookie. Remove from tins after they are almost cool. Cool completely on racks. Tina, we love Reeses here at home. 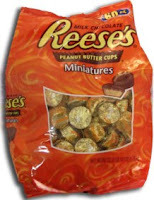 Have you seen the mini reeses pb baking cups that are out? They are so cool. No Teresa I havent seen those yet!!!! How cool I will have to be on a look out for those to use at Christmas time. Hi Sandy Homemade is definitly the best by far, but i was pinched for time. I had so many things to bake for my harvest baskets. + I had a awesome coupon for the BC Cookie Mix I only paid .60 for each pouch. Those are pretty to look at and I just love those really easy recipes that look like you spent alot of time on them. I love reeces PB cups, but I have gotten hooked on the wal mart brand. They are really creamy. Joan I will have to try the walmart brand those sound really good. I have a PB Pie to make so maybe i will use the walmart brand for that recipe. I make those (from scratch, I'll have to try your way as a time saver) and to make it so the PB cups don't melt as I'm pressing them into the hot cookies, I put them in the freezer as soon as I buy them. I'll unwrap 12 at a time and put them in a bowl after i put the cookies in (or however many cookies I make at that time) and re-freeze until the cookies are done. That way, they're solid when I put them int he cookie but the heat from the cookie thaws them immediately without melting chocolate everywhere. Oh these are so cute! I was just looking for a different idea for cookies. I will use homemade dough instead but the result should be the same. Thanks for posting this recipe. You have awonderful blog, when i have a bit more time i will come back and look to your older post to see the other delicious food you make. yum, yum and triple yum.....tell me, what "mint" option might we try with brownie mix??? I love chocolate and mint...very holiday-ish?? Do tell! Su-weeeeet!!!!!!! They look great Tina!!!! HiHoOhio there is mint three musketeers and mint chocolate kisses and even andes mints. I would break the andes in half. I love these cookies, they are so yummy. Wow oh Wow these are absolutely divine!! Wow! We have both the pb cookie dough and the mini Reeses on hand and those look GOOD!